Tickets: Visit www.nicolecheslock.com. Advance purchase highly recommended. November 29, 2011- - Cooks, foodies, scientists and community members will sample mild, medium and robust olive oils during an informed olive oil tasting at Cedar House Sport Hotel in Truckee on Sunday, Jan.22, 2012. Participants will smell, taste, discuss and compare a variety of olive oils as well as hear presentations by Dewey Lucero of Lucero Olive Oil and experts from the UC Davis Olive Center tasting panel at Olive Oils Explored. Olive Oils Explored is an opportunity to explore diverse flavors while learning interesting things about the uses and health benefits of olive oil, said Nicole Cheslock, the event organizer. If you wonder what it takes to earn an extra virgin rating or want to learn about taste and texture, join us. If you've ever wanted to know how your taste buds and sensitivities compare to others, join us. If you're curious about how generic olive oils stack up, this event is for you. The UC Davis Olive Center tasting panel was created after a rigorous process that included screening and training potential members, nearly all olive oil industry experts including growers, producers and sensory scientists. The panel is the first group in the United States to earn the authority to evaluate olive oil quality. Sue Langstaff, a sensory scientist who began her career working with beer more than 20 years ago and has taught at Napa Valley College and UC Davis, is on the tasting panel. She will provide insights and tasting tips during the event on Jan. 22. Each participant will receive a tasting wheel. The Defects Wheel for Olive Oil outlines vocabulary that describes potential defects in virgin olive oil. Langstaff explains the importance of understanding off-aromas and flavors so consumers can make informed decisions about quality and preferences. Langstaff will explore common defects and touch on their origins or possible causes (such as identifying oils that have undergone intense oxidation and resemble wax crayons or stale walnuts). She will also guide participants through the tasting of extra virgin olive oils produced by Lucero, Mad Dog Mesa and others. like to learn about which olives are included in each oil, Scopin explains. I like looking for the defects. I am always interested to see how I compare with others in the industry if what I am perceiving is the same as others. Dewey Lucero grew up surrounded by olive groves. His paternal grandfather made olive oil in small batches, and his maternal grandfather has grown table olives for more decades than Dewey's been alive. When Dewey was laid off from his tech job, he took a chance by opening Lucero Olive Oil. The company is based in Corning, CA (about two hours from Tahoe-Truckee), and, launched in 2005, has won more recognition for its extra virgin olive oils than any other producer in the country. Treat yourself or surprise someone special with an out of the ordinary night in Truckee by attending Olive Oils Explored. Event sponsors include First Trip to Italy, Applied Sensory, Lucero Olive Oil and Mad Dog Mesa. For more information and tickets (advance purchase recommended), visit www.nicolecheslock.com. 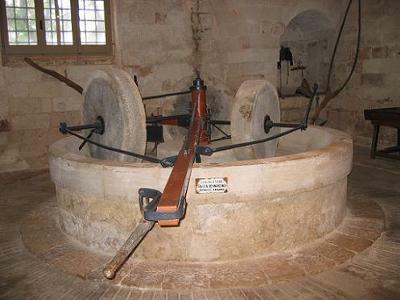 First Trip to Italy excursions include off the beaten path destinations and special sights like this olive press. 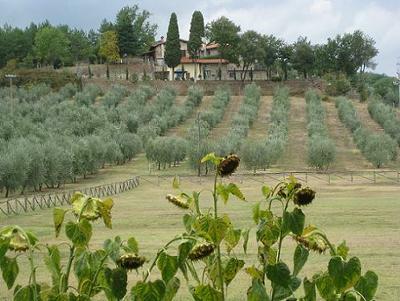 Villa Campestri is a hidden Tuscan gem enjoyed by First Trip to Italy guests. Kathy Scopin, First Trip to Italy's Tour Director, will share her experiences training as an apprentice for the UC Davis Olive Center's tasting panel at Olive Oils Explored on Jan. 22.
www.nicolecheslock.com or call (530) 548-5010. Thanks for the great coverage of our Jan. 22 event kicking off the winter 2012 event series at Cedar House in Truckee. Love it! Gorgeous Picture! This sounds like a fun event! Thank you for sharing your event with the Truckee Travel Guide Website!